Red Velvet Impresses with "Be Natural"
At best, song remakes can go right, and at worst, it can go horribly wrong. While we continue to argue if SM’s in love or being lazy with music covers, there’s no stopping these reinterpretations from coming. Most recently, it’s Red Velvet, SME’s newest girl group that returning with a remake of “Be Natural.” Coming from the album “A Letter from Greenland,” the song was originally sung by first-generation idol group S.E.S. My personal opinion of the song is that it would’ve worked better as an introduction to the group, not as a follow-up to their first single. Nevertheless, without comparing it to the original, Red Velvet has gone and done a good job of it. Smoky and seductive, “Be Natural” is a song and concept that works for the girls. Recalling the song, it’s a soulful jazz number that’s smooth and laid-back. This is a clear departure from Red Velvet’s chipper, electronic debut — and it’s a departure that’s greatly welcomed. As with slower renditions, we get to hear the true quality of their voices, and the group is excellent in that department. Undoubtedly, there’s room for growth, but the girls have shown maturity image- and voice-wise. The song speaks of the sort of love that sets you on a journey of mystical proportions. What this has to do with the title, I don’t know. Perhaps, it refers to a kind of love (or lover) that allows a person to be their most real self. The video is done in an altered one-shot method. The various dance sequences are performed and spliced to make it seem as if it were all filmed at once. What differentiates this “one-shot” is the transitions between the scenes. There are outfit changes, setting swaps, and effects being added. While the flow isn’t quite as smooth as EXO‘s “Growl,” a previous SM masterpiece, it’s been done well — bar the annoying lens flare mess. Although nothing revolutionary has been used in “Be Natural,” this MV serves as a response of sorts, from SM to their naysayers, for the flak they’ve received on their repetitive and unimaginative videos. The choreography here is also on point. Chair dances come in different forms: fun, dangerous, seductive, and so on. Red Velvet takes the seductive route, adding a layer of sultriness and sensuality to the jazz cover. They manage to do it without making it look skanky. Additionally, the dance has both individual and group moves. The choreography sees the girls relying on each other to perform some of the steps — and these sorts of dances make some of the best visuals in music videos. With a single one out of line, the whole sequence could collapse. One clear example appears during the ending chorus — someone could’ve been kicked in the head. All in all, the moves are clean but not precise to the point that it would lose some of its sultry oomph. Like the dancing, the fashion is great too. Red Velvet looks flawless in their suits. It’s difficult to go wrong with a well-tailored suit, whether you’re a girl or a boy. Those t-strap heels also make the perfect accessory. Complete with dark flowing hair, the girls have just the right touch of fashion and sophistication. The clean lines on the suits add to the sleekness of the dance — it’s an impeccable composition. With all that said, the one thing that sticks out like a sore thumb is Taeyong of SR14B (or SM Rookies). His rap segment isn’t bad (especially in comparison to other SM “rappers”), but it’s added nothing to the song. This insertion is a repetition of the one in the original. My indignation towards this is better exemplified in the live performances of the song. Evidently, Taeyong’s appearance is a publicity move for the young man, as well as a short interlude for the girls. See how little it mattered, in the live version — he wasn’t even there. 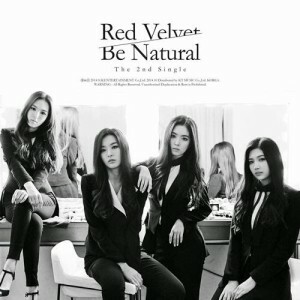 Now, bringing S.E.S back into the picture, how does Red Velvet’s “Be Natural” compare to the original? It’s not really a match-up to the song by the gifted first-generation trio — they’re still known for their vocals — but the quartet does it justice. Vocally, it’s as close a match as it can be, which is good and bad. It would’ve been nice to hear more “Red Velvet” and less “Red Velvet-mimicking-S.E.S.” I suppose the blame for that can go to the producer, for not encouraging the group to make it their own song. With the MV, there’s no point in comparing Red Velvet’s evocative redo with S.E.S’s monochromatic original. They’re vastly different due to the trends and technologies of their respective periods. It suffices to say that the SM newbies have held their own, and that their video has the style and coherence that K-pop audiences have grown to like. Despite its status as a remake, it’s — to me — a more significant effort than “Happiness.” I can only hope that Red Velvet will take this through to their future original releases.